ALBANY, N.Y. - Napheesa Collier had 25 points and 10 rebounds to help No. 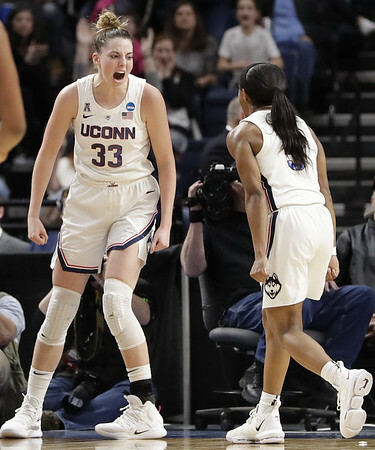 2 UConn rally to beat sixth-seeded UCLA 69-61 on Friday night in the Albany Regional semifinals. The loss ended a strong run for UCLA (22-13). The Bruins won 10 of their final 12 regular-season games after losing its top two scorers from last year to the WNBA in Jordin Canada and Monique Billings. The Bruins stumbled through two separate four-game losing streaks during the season, but really got going in Pac-12 play. They made it to the conference tournament's semifinals before losing to Oregon in overtime. STAYING EAST: UCLA came straight to Albany after beating Maryland on Monday. It just made more sense for the Bruins to not take two cross-country flights by going back home. It helped that the school was on spring break so the players didn't miss any classes. TIP-INS: UCLA fell to 0-6 all-time against UConn, including also losing in the Sweet 16 in the 2017 NCAA Tournament. The Bruins were trying to make an appearance in the regional final in consecutive seasons. ... UConn wasn't a one seed in the NCAA Tournament for the first time since 2006. ... UConn continues to flourish in the NCAA Tournament when playing in the Northeast or Pennsylvania. The team is 73-1 since winning its first title in 1995. The lone loss came against Duke in the regional final at Bridgeport, Connecticut in 2006. The Huskies last lost a Sweet 16 game the year before when they were beaten by Stanford. .... UCLA outrebounded UConn 41-38. Posted in Newington Town Crier, UConn on Friday, 29 March 2019 21:26. Updated: Friday, 29 March 2019 21:29.